You’d think it would be easier. We have far more resources than ever- the Internet, the myriad blogs, the self-help books jumping off the shelves, the e-books on our Kindles and iPads, the numerous moms out there who’ve seen that and done it all- but we still fall short. We are still not in complete control of every single thing that happens in our lives. We can’t be. It’s just not physically possible. Yet, we balk when it comes to talking about the tough days- as a mom, as a wife, as a daughter, as an online friend, as a bosom buddy, or to put it quite simply, as a person. Why? Is it the fact that we will be judged, no matter what? The more painful the situation and the more openly you talk about it, for every ten supporters that you have or fifty, there will be that one person silently shaking her head in disapproval. Talking about my depression was so hard for this very reason. There’s always been this image that people create of another person, based on their limited understanding of what they know. And once you’ve created that image- through your actions or behaviour- there is a pressure to keep the mask on. If you let it slip, for any reason, be ready for the judgment. Nowhere is this more clear than in the realm of social media. Friends who know you well (virtually) will take umbrage if you don’t reply to a private message or respond to an e-mail. Acquaintances who send you a friend request wonder why they haven’t been accepted into the circle of trust. People you’ve known for a while will turn their noses up and leave a sarcastic note saying how you never seem to have time for them. Of course my life isn’t a picnic! I am not sailing through parenting with a know-it-all crown on my head, doling out tips on yelling less and parenting with positive thoughts all the time! There are days I completely lose it, where I break down and cry in the confines of the shower, where my sobs cannot be heard. I sit and brood with a cup of tea in my hand, wondering if I am doing the right thing by being firm with my daughter on some days. The terrifying thought that I could be snapping emotional connections with her crosses my mind, every three days, when things don’t happen the way that I expect. Amidst it all there is the Pinterest-worthy image of this Doting Mom who seems to handle it all, with a serene smile on her face. Yet, that isn’t the whole reality. It never can be. I’ve done it too, you know. The judgement, the taking offence, the sarcasm- yes, I am guilty. But if the last few years of blogging have taught me anything it is that I must expand my sphere of acceptance. Just half an hour of scrolling through my Facebook feed is enough to show me that all people really want is to be loved. They want to be accepted. They want to be taken for who they are. To begin with feeling that compassion for others, though, I must first begin with myself. So, I start by talking about the tough days- the ones where I yell, when I feel so sad that the earth could open and swallow me up, the ones where I feel like slamming my fist into the wall to stop the anger from crushing me, the ones where nothing seems worthwhile. To offset it all, I have the glorious days- the ones of pure joy, the ones of incredible openness, the moments of sheer exhilaration to lift me out of the depths. Why? Because life is like that. Life is not peaches and cream. Nor is it a rocky road. It’s like a tub of vanilla ice-cream with chocolate chips and a plate of salted chips on the side. You don’t really know why, but taking a bite out of the salted chips makes you savour that sweetness even more. So let’s begin by embracing the tough days, reveling in the good ones, enveloping everyone in the circle of compassion. Face it, we need each other. That’s the Zen of existence, to be honest- Not to always be calm in the face of grief or joy, but to observe it all with a quiet detachment. Through the sad times and the happy days, we need each other. Let’s pledge to talk a bit more frankly about those tough days and help each other heal. I too have my tough days when I loose the fine thread of my patience and spank & hit my 4 year old. And then I feel terrible doing that because I never intended to resort to hitting in my parenting, the thing I was frequently subjected to as a child ( this was the norm when we were growing up). I cry inconsolably later and promise myself not to repeat the same and work hard on myself. Once or twice I did give it a thought to write a blog post on this but could never do so. Very true Shailaja, social media is mostly about the glitter and smiles and not about the raw emotions that all of us must go through. Here's to more bravery all around :). It takes a lot of courage to open up and talk about your bad days.. your weakenesses and that is something that makes you more human.. Being perfect all the time, looking perfect, preaching perfection without the bumps is not rational and neither it is possible.. I really admire the way you take things and write about them.. Be it the judgement, virtually or physically, it's always there. The hope of trying to be the best and then breaking down in between, with a vigour to stand up again and make your way.. That's what being human is.. And you truly depict all of it in the form of your writing..
Hugs Shailaja. As much as technology connects, it also disconnects in weird ways. Nothing like actually meeting folks, face to face, holding hands, hugging for real and venting out and laughing as your worries disperse and the endorphin kicks in, healing those hurts. So much harder to balance life these days. I think you're bearing up just fine. Just being able to write clearly… is proof enough eh? To be really honest Shailaja, while I agree with you completely, I find this incredibly difficult to do. As much as I would like to say that I can do all of it, the truth is that as of now, I can't. One on one, yes. A social forum, no. Initially it was the judgement that made me cautious, now I could care less about it. I think it is mostly self preservation at this point. However, at the risk of sounding extremely hypocritical, I have always been thankful for people who have been able to express their difficulties publicly, especially on their blog. Critics and judgmental people aside, it helps a lot of others who are going through the exact same thing. For instance, 2 of your posts came at a crucial time for me – The mother of all meltdowns and 4 Steps to a Kinder you. I was struggling through very similar emotions, and I can't even begin to tell how much lighter my load felt after reading those posts. 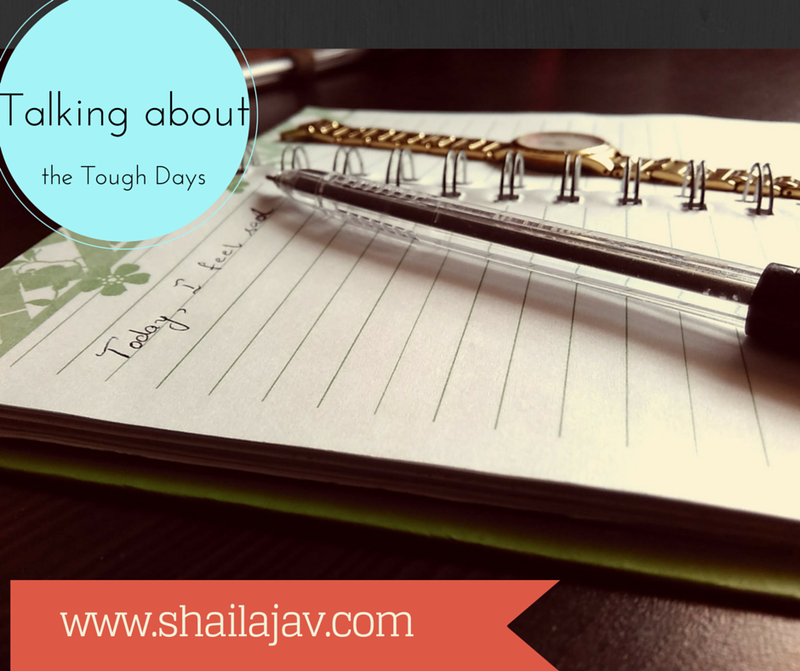 That you are willing to talk openly about tough times is a testament to your inner strength, Shailaja. These days it seems all to common to project a picture of the perfect life on social media. I too have begun to talk about my pain and though it makes me vulnerable, I feel better for being open and honest. I'm certain that your honest sharing will help a lot of Moms out there, as Shanatala's comment proves already! I only get through tough days by having these sadist thought – everyone you meet is fighting a harder battle. I don't talk very openly about the difficulties online because I have friends around me with whom I can talk. But it would definitely get easier if I could write here without being judged or felt sympathy for. Anamika, saying it out loud, through the written word , is a great first step. Don't you realise you have done just that with this comment? Perhaps you can draft the post and keep it for yourself to read. You don't need to publish it if you are not comfortable. Trust me on this. Writing heals. I'm one of those who cannot write about tough times. I don't think I have the vocabulary to be able to express it. I need to talk and so I pick up the phone and bug my sister. I write about it much later when I can think about it with a stable clear mind or maybe not at all. You are blessed with an amazing maturity if you can put it down here. Amen to that Aparna. You, more than anyone, know what I mean. Not rational, completely agree.After all, what are we trying to prove? That it is wrong to feel hurt or upset or sad? Or that it is important to be human and feel all emotions in equal measure. Very true indeed. Truer words were never spoken, Vidya. As much as it connects, yes it can completely disconnect too. Writing is my one true salvation, Vidya. Nothing feels better on the days that I am down and out. Nothing. Hugs. Just as Tulika mentioned, I can't write/talk about tough days when they are still fresh. But yes, can share when the trying times are long gone.I have realized that the life after fire fighting situations make for some fabulous stories! I completely agree with you, Shailaja. Surprisingly I am very open on my blog. I have shared my frailties, failures and insecurities quite openly. And, I have never regretted it. Often the love and warmth that I get in the comments tears me up. I know, I am sentimental. It makes me feel supported and cherished. It also makes me feel naked, now that I have put my feelings out there. It makes me feel human too. Even the last post that I wrote in a burst of emotions had me smiling when my blogger friends rallied around sharing their experiences and wishes. I say bring more topics not spoken about on the table. Let us all discuss and acknowledge our failures as much as we laud our achievements. It truly helps. Agree that everyone has their problems, life is not a cake walk for that matter in any aspect. It's just that the maturity you have to retrospect on such things.. that and that alone can tell us if we are taking the right path. Thank you for sharing. Having the good days AND the bad days is the truth of everyone, but a truth that so many fear to share. Sharing the good and the bad opens up connections to others that you might not have connected with otherwise, because they too are struggling. And if someone judges you for your bad days, that is completely their problem and not yours. Keep up the good work! Hugs. We all have these days and you're right, they are not forever. Good and bad days, they come and go. It is much easier to talk about the glitter and happy stuff than it is the real sad moment that we sometimes found ourselves to be stuck in. It takes more courage to do that. It began two years ago and then I retreated into my shell and spoke about safe things. Now, since February, I've begun to open up again. It helps. In so many ways. Very heartwarming to see you here, Corinne. Thank you so much for stopping by and reading. Woah! That's a long post. Also one of your more 'free-flowing-thoughts' kind of one. I liked it. and I agree – we need to talk more about those tough days. It'll not just help the person who has had one such day, but may give some pointers to the others too. I know that talking about the difficulties is very tough. Most days I call up friends and talk. It's just that talking about it on the blog every now and then helps as well. Not always. Some days. Writing without being judged is tough, i know.